Aspen is preparing a joint Environmental Impact Statement/Environmental Impact Report for the Alta East Wind Project in compliance with the California Environmental Quality Act (CEQA) and the National Environmental Policy Act (NEPA). The CEQA lead agency is Kern County and the NEPA Lead Agency is the U.S. Bureau of Land Management (BLM). 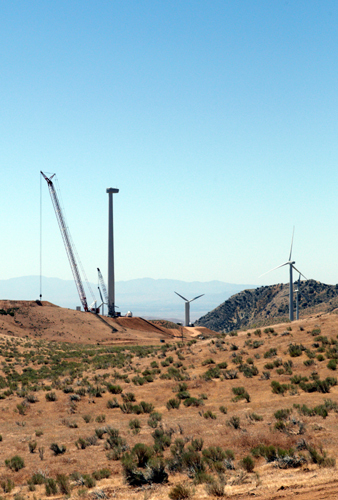 The Alta East Wind Project will generate up to 318 megawatts of electricity through wind power within the Tehachapi Wind Resources Area, and includes 120 wind turbine generators, a substation, transmission interconnection to the Southern California Edison Windhub Substation, access roads, and ancillary facilities. The project site comprises 2,592 acres located approximately three miles northwest of the unincorporated town of Mojave in southeastern Kern County, California; 568 acres of the project site are located on private land under the jurisdiction of Kern County, while the majority of the site is located on BLM-administered land. The proponent also filed an Application for a Right-of-Way (ROW) Type 3 Grant with the BLM (CACA 052537) and a resource management land use Plan Amendment (PA) to the California Desert Conservation Area Plan (1980, as amended). Approval of this ROW grant and PA by the BLM would authorize the construction, operation, maintenance, and decommissioning of the portion of the project located on BLM administered lands. The EIS/EIR evaluates six alternatives to the proposed project, including one revised site layout alternative, two reduced project alternatives, and three ROW Grant and County approval alternatives. Information contained in the EIS/EIR will be considered by the BLM in its deliberations regarding approval of the ROW grant, as well as a Land Use Plan Amendment and a Specific Plan Amendment, and by the County to consider authorization of a change in zone classification to include the Wind Energy Combing District for certain private lands and a conditional use permit for the use of a temporary concrete batch plant during construction of the project. Aspen is also reviewing applicant technical studies, preparing data requests, conducting field work for biological and cultural resources, and coordinating activities with BLM and Kern County.